Hawkesbury - EXIT Realty Premier - Guy Bonin Ont. Hawkesbury and the surrounding region that I represents is a great place to live and raise a family. Located within an easy commute to Canada's two largest cities, Highway 417, linking Ottawa with Montreal, provides quick convenient transportation to either location. Its proximity to Highway 401 allows ready access west to Kingston and Toronto and east to Quebec City and Trois-Rivières. A direct route south, Highway 34, offers access to the city of Cornwall, the St. Lawrence Seaway with its ocean-going ports and the International Bridge connecting Canada with the United States. Major airports are close at hand with international flights departing from Montreal's Mirabel and Dorval airports and Ottawa's Uplands airport. 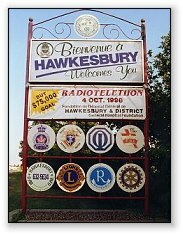 Within a 10-hour drive of Hawkesbury, there are over seventy-five million people and some of the world's largest markets. People in our region know there's more to life than work. When the work day is done, you will find a wide range of sport, recreational, cultural and educational facilities close to home. Hawkesbury and the surrounding region are a virtual paradise for nature and outdoor sports enthusiasts. Hawkesbury is a short distance from the legendary ski resorts of the Laurentians and within minutes of hundreds of fishing lakes. You'll find two spectacular golf courses in Hawkesbury. If skating or swimming are more your style, our sports complex features a semi-olympic pool, two indoor skating rinks and is the home of the Hawkesbury Hawks, our Junior A hockey team. When it's time for more solitary pursuits, the Hawkesbury Public Library offers more than 70 000 publications and is linked to the University of Ottawa Reference Center. The library is located in a beautifully-landscaped setting as part of the Town Hall complex. The favorable climatic conditions found in the Hawkesbury area offers a varied recreational and social life. The snowfalls that are so often a problem in some communities do not pose a difficulty for the Town. With adequate snow removal equipment in operation, little or no effect is experienced by transportation and communication systems. If flying is of interest, the Montreal Soaring Council is located just west of the town limits. The Province of Ontario also operates a beautiful camp ground Voyageur just minutes from downtown.